Kyrgyzstan, officially named the Kyrgyz Republic (Kyrgyz Respublikasy), is a landlocked republic in the eastern part of Central Asia which is bordered in the north by Kazakhstan, in the east by China, in the south by China and Tajikistan, and in the west by Uzbekistan. 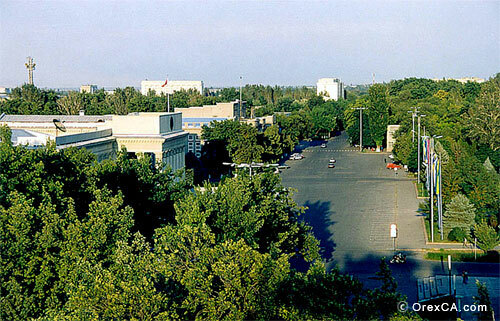 Bishkek is the capital and largest city. Land boundaries: Uzbekistan - 1,099 km, Kazakstan - 1,051 km, Tajikistan - 870 km, China - 858 km. Time: GMT + 5 (GMT + 6 from second Sunday in April to Saturday before last Sunday in September). Aspect: 1:2. It is a red cloth. The center posted a picture of sun-yellow. 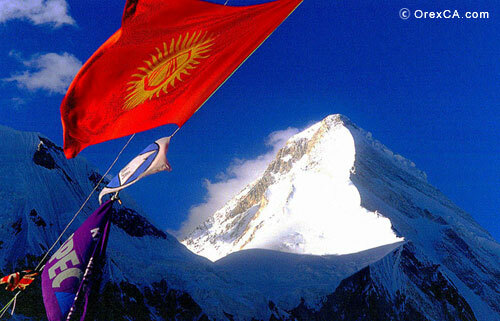 At Sun posted a symbolic image of Kyrgyz yurta. Adopted in 1992, the red flag symbolizes the valor and courage. The sun symbolizes peace and wealth, and the image yurta - a symbol of the country and the world. The coat of arms of Kyrgyzstan was adopted on 2 June, 1992, following the dissolution of the Soviet Union. The coat of arms has a circular form and mostly bears the color blue, as light blue is the Kyrgyz color of courage and generosity (as on the flag and coat of arms of Kazakhstan). To the left and right of the coat of arms, wheat and cotton are displayed. In the upper part, the name of the country appears in Kyrgyz "Кыргыз Республикасы" (Kyrgyz Respublikasy). The Kyrgyz, a Turkic-speaking people, constitute a slim majority of the multi-ethnic population of Kyrgyzstan. The constitution enshrines Kyrgyz as the country's state language, although Russian continues to be used widely. Kyrgyzstan became part of the Russian Empire in the late 1800s. In 1924 it was incorporated into the Union of Soviet Socialist Republics (USSR) as an autonomous region, and in 1936 its status was upgraded and it became one of the 15 constituent republics of the USSR, officially called the Kirghiz Soviet Socialist Republic (SSR). The republic was also commonly known as Kirgizia under Soviet rule, and Russians continue to call it that today. Kyrgyzstan became independent from the USSR in 1991. In 1993 the republic ratified its first post-Soviet constitution. 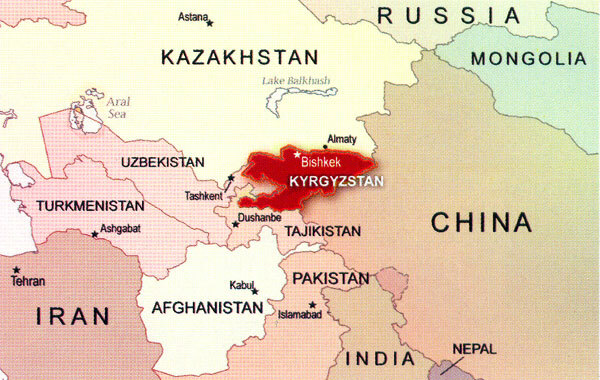 The total area of Kyrgyzstan is 198,500 sq km (76,640 sq mi). The country is almost completely mountainous. More than half of Kyrgyzstan lies at an elevation higher than 2,500 m (8,200 ft), and only about one-eighth of the country is lower than 1,500 m (about 4,900 ft). 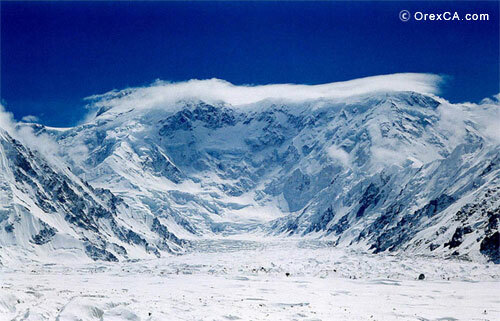 Glaciers and permanent snowfields cover more than 3 percent of Kyrgyzstan's total land area. An underlying seismic belt causes frequent earthquakes. Kyrgyzstan is located at the juncture of two great Central Asian mountain systems (the Tian-Shan and the Pamir). These two systems are geologically separated from each other in southern Kyrgyzstan, between the Alai Mountains of the Tian-Shan and the Trans-Alai Range (Qatorkuhi Pasi Oloy) of the Pamir. The Trans-Alai Range, which is the northernmost part of the Pamirs, forms part of Kyrgyzstan's southern border with Tajikistan. The main ridge of the Tian-Shan extends along Kyrgyzstan's eastern border with China, on a northeastern axis. Victory Peak (known as Pik Pobedy in Russian and Jenish Chokosu in Kyrgyz) is the highest peak in the Tian-Shan system at an elevation of 7,439 m (24,406 ft). Located on the Kyrgyz-China border in northeastern Kyrgyzstan, Victory Peak is also the highest point in Kyrgyzstan and the second highest peak in the former USSR. A series of mountain chains that are part of the Tian-Shan system, including the Alatau ranges, spur off into Kyrgyzstan. Most of these ranges run generally east to west, but the Fergana Mountains in the central portion of the country run southeast to northwest. 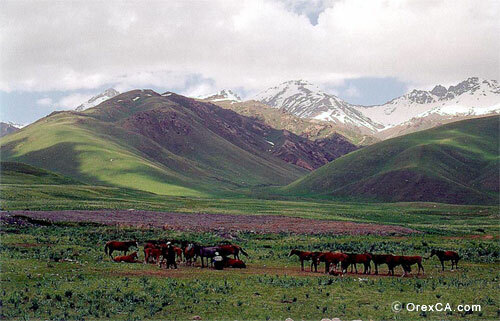 The Fergana Valley in the west and the Chu Valley in the north are among the few significant lowland areas in Kyrgyzstan. The Naryn River, Kyrgyzstan's largest river, originates in the mountains in the northeast and flows westward through the middle of the country. The Naryn then enters the Fergana Valley and crosses into Uzbekistan, where it joins with another river to form the Syr Darya, one of Central Asia's principal rivers. The Chu River, in northern Kyrgyzstan, flows northward into southern Kazakhstan. 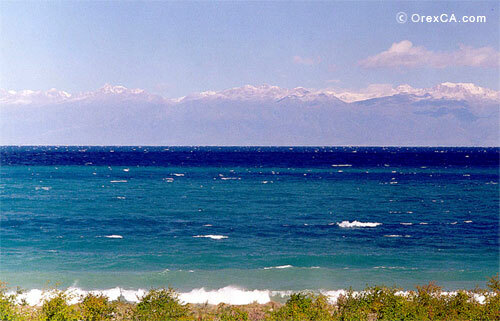 Yssyk-Kul, the largest lake in Kyrgyzstan and one of the largest mountain lakes in the world, is located at an altitude of 1,607 m (5,273 ft) above sea level in the northeastern portion of the country. Forests occupy 4 percent of the country's land area. Coniferous trees such as the Tian-Shan white spruce grow along lower valleys and on north-facing mountain slopes. Many rare animal species inhabit the woodlands, including the Tian-Shan bear, the red wolf, and the snow leopard, which are protected by government decree. Other animals in Kyrgyzstan include deer, mountain goats, and mountain sheep. Kyrgyzstan's mountain lakes are an annual refuge for thousands of migrating birds, including the mountain goose and other rare species. Kyrgyzstan's landscape, blessed and bedevilled by a dramatic range of weather conditions and altitudes, supports an astoundingly rich diversity of plant and animal life. King of the mountains, the graceful, swift snow leopard - packed with muscle and sporting a long tail for balance - is finely honed to survive in snowbound peaks. Marco Polo sheep, their horns comically coiled, tread the high mountains along with the world's largest ibex whose horns can reach 60 inches. The Tien Shan brown bear and grey wolves patrol the valleys near Bishkek and Karakol. But the visitor is most likely to see marmots - bundles of fur with shrill shrieks - and, if you're lucky, the giant (Menzbier) marmot which lives only in the Tien Shan. 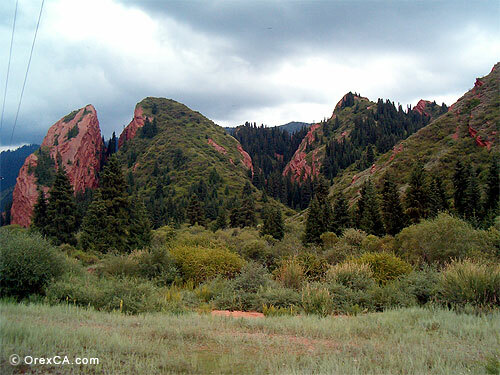 Kyrgyzstan is renowned for its botanical diversity, with some 400 species exclusive to this country. Varieties of tulip, orchid and wild onion are unusually abundant and alpine plants, such as edelweiss, are the trekker's constant companion. The rare aigul flower grows in the Alai Range. The south boasts globally important forests - including rare types of walnut and pistachio - testament to the untouched wildness of this extraordinary land. 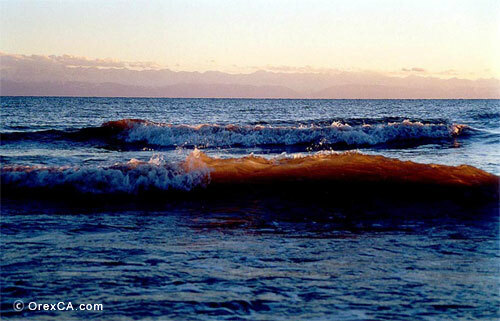 Kyrgyzstan's natural resources include significant deposits of gold and other minerals. Also present are deposits of coal, uranium, mercury, antimony, nepheline, bismuth, lead, and zinc. Exploitable but small reserves of oil and natural gas also exist. The country's fast-flowing rivers provide hydroelectric power. Only 7 percent of the total land area is cultivated. The country's climate varies by region. 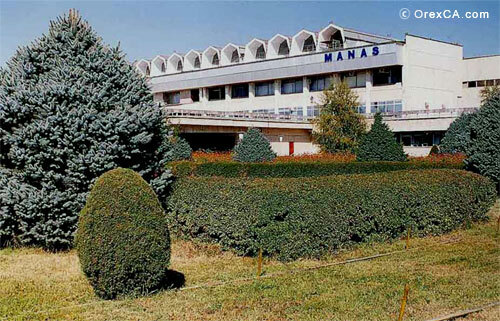 The climate is subtropical in the Fergana Valley and temperate in the northern foothill zone. The lower mountain slopes have a dry continental climate, as they receive hot desert winds from Kazakhstan and Uzbekistan, whereas the highest mountain elevations have a polar climate. In the valleys, the average daily temperature in July is 28° C (82° F). In January daily averages are as low as -14° C (7° F). Conditions are much colder at high elevations, where in July the average daily temperature is 5° C (41° F) and in January, -28° C (-18° F). Precipitation is between 100 and 500 mm (4 and 20 in) in the valleys and from 180 to 1,000 mm (7 to 40 in) in the mountains. OVIR is an abbreviation, which stands for the Visa and Registration Department of the Ministry of Internal Affairs. Kyrgyz law currently states that foreign visitors, including travelers, must register with OVIR within three working days of their arrival in the country. However, the government issued an order (No. 213, dated 15/04/03) which decreed that citizens of EU countries, USA, Canada and Australia in the country for up to one month no longer need register. National currency is the Som = 100 tyin. The Kyrgyz economy is basically cash based and the US dollar is the most widely used foreign currency (the Euro and other currencies are commonly accepted). There are exchanges in all cities and most towns. The general advice is to bring US dollars if possible (new notes, post-1995 if possible; clean and unblemished). 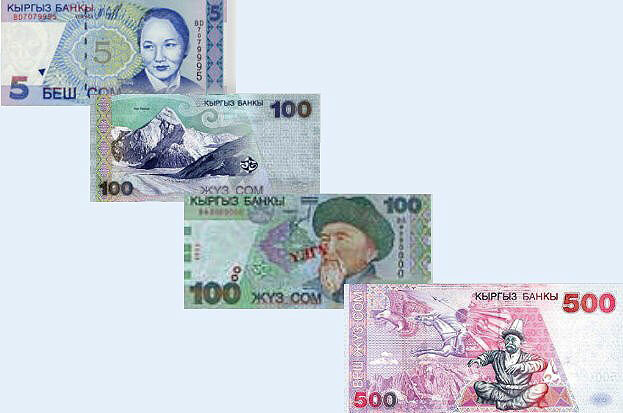 Higher denominations bring better exchange rates but must be in near-mint condition. Cash advances on major credit cards (VISA/MasterCard) are available in several banks in Bishkek with about a 4% commission. Many banks now operate Western Union Money Transfer services. The village of Kyzyl-Bairak has opened a monument in memory of Atake-baatyr and his great-grandson, Shabdan-baatyr, who did much to unite separate Kyrgyz tribes. The memorial has been build through donations gathered all over the country. President Akayev's children - daughter Bermet and son Aidar - are the initiators of the monument's construction. Atake-baatyr stands on a pedestal with a snow leopard at his feet and a scroll of paper in his hands. The statue faces the sun rising from behind the mountains. In Russia in the mid-18th century Atake-baatyr was called the prince of the Kyrgyz tribes. This year marks his 265th birthday. The road to the memorial is covered with pink sand and has fir trees on both sides. 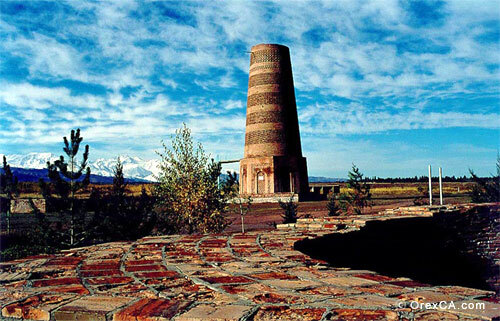 A museum, left of the monument, keeps unique photographs and documents on the history of the Kyrgyz people. Some of these pictures and documents have never before been exhibited.